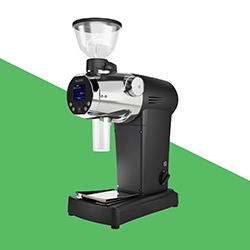 Home » Espresso and Coffee How To Articles » News » New Product Arrivals » The New Mazzer ZM has Arrived! The Mazzer ZM is now available! Read our review and find out why it is one of the most talked about new products on the market and how it sets itself apart from your favourite filter coffee grinder. A Mazzer grinder for filter coffee may be the thing we never knew we desperately wanted. And now that it's here, we're very impressed. Before getting into the specs and details, let's talk about the look. We first saw this new machine at the SCA Global Specialty Coffee Expo, where it was debuted. This is Mazzer's first new machine in nearly 4 years, and the time and attention to detail is obvious even from a cursory look. The body has a more compact and sleek feeling than previous models and more vertically designed, giving a thinner and less bulky look. The digital screen is immediately impressive and has a menu, which is always a good sign, since the presence of a menu indicates many features. And many features it has! Firstly, let's talk about its main purpose: grinding filter coffee. Mazzer recognized a demand and a need for a high end, quality grinder for filter coffee and decided to jump in head first. They designed the ZM completely from scratch to address many of the issues and desires people had with filter coffee grinders. Classically know for their espresso grinders, they decided to not take the easy route (something like selling the Mazzer mini with different burrs), and made something new. Although they couldn't fully forget espresso; you can order a set of espresso burrs for the ZM to turn it into a espresso grinder. Now for the new, juicy details. Cleaning is a breeze, as the digital panel slides aside to allow for easy access to the grinding chamber. The retention is low, like, really low. Once used and the few crevices are filled, Mazzer says that retention will be at 0%, which means way less coffee waste. There's also the burr calibration, that allows you to set the distance between burrs and then save that setting, to allow for auto calibration after removing or replacing the burrs, saving you from recalibrating manually. Their feature "Electronic True Zero" allows you to use the same settings from one machine to another, so you can have consistency from cafe to cafe, grinder to grinder. There's also improved particle distribution, if all of the other features weren't enough. The Mazzer ZM is expected to change the game for specialty filter coffee, grab yours here. Comments on The New Mazzer ZM has Arrived!